The transformative potential of AI is being discussed more and more in boardrooms, parliaments and cafés all over the world. Forecasts such as a $14 trillion increase in global GDP, and 40% increase in productivity by 2035, are a testament to the power of its perceived benefits. Governments are waking up to the fact that AI could transform their economies, public services, and workforces. If governments are to capitalise on the AI opportunity, they need to have well thought out structures and processes in place to do so. Our recently-published government AI readiness index found that some countries are more ready than others. But while we measured government AI readiness as the interplay of different things like innovation in government and the number of tech startups in the country, there is more that governments can do. A select group of countries have produced forward-thinking and wide-ranging policy documents to lay out a strategy for how they plan to maximise AI’s benefits, and mitigate its potentially negative impacts. Some countries have AI strategies under another name. The UK’s Industrial Strategy contains significant AI policy proposals; this, combined with an extensive independent review, makes the UK another world-leader in AI policy. In the USA, three reports completed under the Obama administration, including a research and development strategy, demonstrate America’s own potential policy approach. This is an elite club, with these countries declaring themselves global leaders in AI. 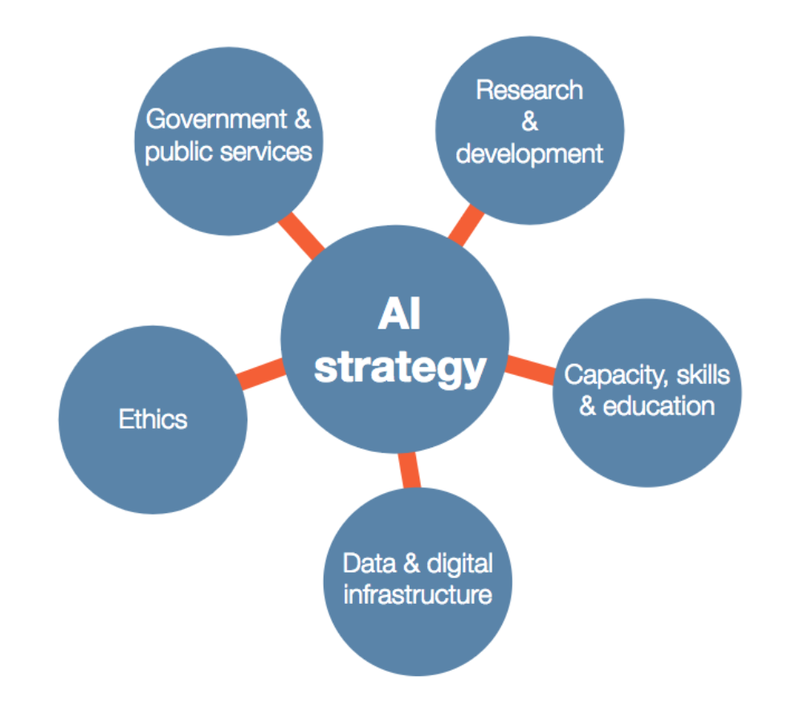 At a broad level, our review of these strategies revealed that they share five key themes: ethics; using AI in government and public services; research & development; capacity, skills & education; data & digital infrastructure. The next leaders in AI governance would do well to structure their strategies in similar ways. The countries we examined had varied takes on these themes, reflecting their societies’ values and priorities. As this suggests, crafting any new AI strategy will require answering difficult but important questions. For example, should research and development in AI be mostly driven by the public or private sectors? Where should education in AI be focused, and how should it be funded? How can governments ensure monitoring and enforcement in relation to ethical issues? How should governments support innovation taking place in universities, startups and big companies? What is the best route to gathering and managing the large volumes of data required for widespread AI experimentation and implementation? Leaders in the field are already investing heavily in institutions bringing together great researchers and innovators working in AI, such as the UK’s Alan Turing Institute, set to become a new national centre for AI research, and Canada’s Vector Institute. Ambitious research into AI ethics is also underway: in the last months of 2017, for example, the French Digital Council set out to interview over 200 people, including business leaders, philosophers and sociologists. For the smartest governments, 2018 will be the year of the AI strategy. Those countries that fail to move soon risk being left behind. The next generation of innovators and investors will move their talents and their capital to wherever they will be best used. Would you like to talk about how to write a comprehensive, innovative and ethical AI strategy? Email Richard@oxfordinsights.com or Emma@oxfordinsights.com.